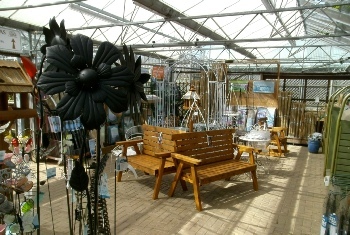 The Garden Centre stocks a wide range of Trees, Shrubs, Conifers, Climbers, Roses, and Seasonal Bedding etc. together with vegetables in season. 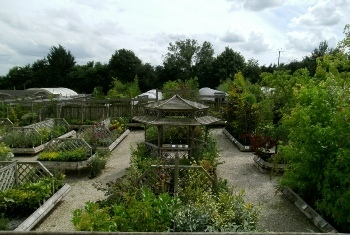 The Garden related sundries include a massive selection of pottery, timber tubs and barrels, garden ornaments, trellis and screens, Arches and Obelisks, hand tools, planting aids, composts, garden chemicals etc along with Giftware, Homeware and many other Garden and Home related items. 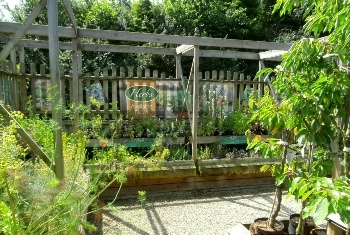 The Garden Centre carries large stocks of Shrubs, Trees and Conifers. Many of the trees are grown on site and some are available as semi-mature specimens not readily available at other local suppliers. 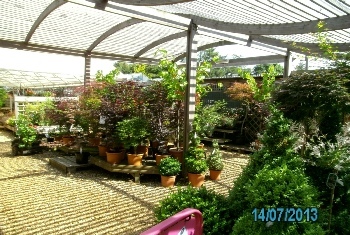 Shrubs are also stocked in a mix of sizes with as many as possible available all through the year. Conifers give both colour and structure to the garden and are available as low growing varieties through to semi-mature specimen plants. A large range of Fruit Trees are available including apples, plums, and pears. 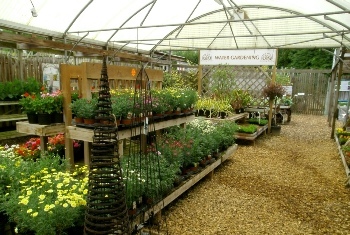 Some varieties are available as fan trained or column style trees together with dwarf patio trees. Family trees, having several varieties of fruit on one tree, are also available. Soft fruit includes red, white, and black currents, Gooseberries, Blackberries, Blueberries, Raspberries etc, and container grown strawberries. A variety of culinary & decorative herbs are also available in season. 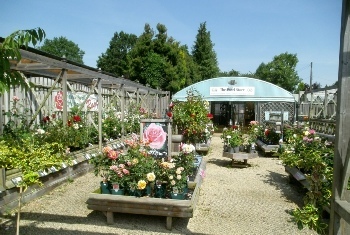 The Garden Centre normally carries a wide variety of roses including hybrid teas, Floribunda, climbers, Ramblers, Shrub roses and Patio Roses. A small selection of standard roses is also normally available. The large selection of wall shrubs and climbers covers Pyracantha, ceanothus, Hydrangea, Clematis (both deciduous and evergreen), Honeysuckles, Passion Flowers, Wistenas, and Ivies. A number of additional specialist climbers appear in season. Much of the selection available is grown on site with the summer bedding including the full range of favourites. Fuchsias, and Geraniums come in a large selection of varieties together with Cape Fuchsias and Marguerite Daises, in season. Patio Plants include Dahlias, Garden Pinks, New Guinea Impatiens not to mention a huge range of basket plants. Autumn and Winter bedding is available in season and includes Pansies, Violas, Wallflowers, Primroses, Cyclamen along with many others. A separate display area houses our range of Herbaceous and Alpine plants together with a selection of Ferns and decorative grasses. Herbaceous plants are available in a selection of pot sizes from 11cm up to 5 litre or 7.5 litre. Alpines are usually available in two pot sizes while ferns and grasses appear in up to 3 different pot sizes. The range of plants available will change according to the season. 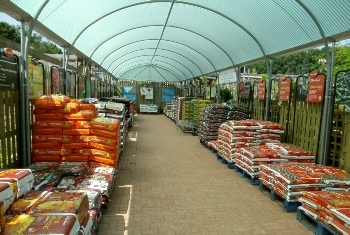 The Garden Centre stocks a range of approximately 40 different products including growing media, composts, barks, mulches, soil improvements, manures, and grow bags etc. 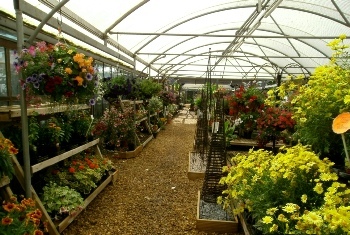 Many are available in different sizes, both peat based and peat free. A full range of John Innes composts are always available together with Ericaceous and specialist compost. A huge selection of decorative terracotta & glazed pottery, in a vast array of sizes, can always be seen in our covered display areas with many items on special offer. 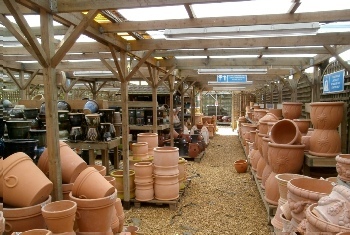 A full range of standard Terracotta flower pots, strawberry/herb pots, and bulb bowls is kept along with a selection of plastic flower pots, containers, wooden barrels, and Fibre clay planters. Our Stoneware ornaments are available in concrete or reconstructed stone and include Bird baths, ornaments, classical statues, and sundials etc. A selection of Arches in both timber and decorative metal is available in many styles along with bamboo and reed flexible screening. Lightweight timber trellis panels are kept in a selection of styles, including fan trellis! Decorative rigid willow panels are kept in a number of designs together with metal screens. Garden Obelisks come in a range of designs in timber, willow, or metal. 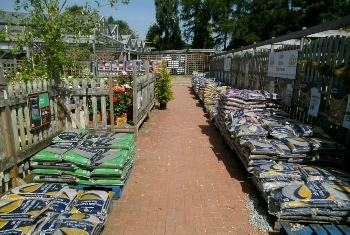 A large selection of different chippings/slates/cobbles are normally held in stock in handy carry home bags with many on special multi buy offers. All are available in bulk bags for direct delivery to the customers home. In addition, the Garden Centre also carries a range of decorative paving, stepping stones, imitation sleepers paving and path edgings all available to take away or delivery can be arranged. The Garden Centre normally stocks a good range of these attractive shrubs and small trees in a selection of container sizes including some larger specimens. The plants are available in a selection of leaf colours from greens through yellows and oranges to deep reds, together with differing leaf styles of larger palmatum shapes to the fine dissectums etc.